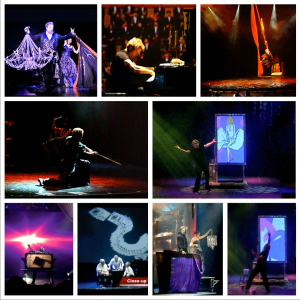 Garin Bader is an international award-winning pianist and master illusionist. There’s no one else in the world that combines the mesmerizing arts of both music and magic along with masterful storytelling thrilling theatrical settings. Garin has performed throughout the world from solo concerts to engagements with symphony orchestras and from the great stages of the world from Carnegie Hall to the London Palladium and from Las Vegas to the highest-rated cruise lines afloat. He has won numerous major international piano competitions such as Artists’ International and the International Chopin Competition of New York as well as awards for his original magic. He performs stunning solo classical piano concerts to shows that are mixed with electrifying contemporary pop and rock music ending with great war-horses of well-known classical composers that display his stunning virtuoso technique on the piano keys. Additionally, he often fuses his innovative magic illusions, original piano compositions, masterful storytelling, along with beautiful dancers into his shows to further enhance his audiences’ visceral experience that delight all their senses. “…a unique combination of consummate ability in both music and magic…an extraordinary event! The video above shows a few highlights of this from his spellbinding show called, “Musical Magic”, which is a full evening experience combining his virtuoso piano playing with many stunning original and classic magic illusions. His exhilarating and highly acclaimed theatrical shows draw larger crowds for concert theaters and corporate venues because his unique one-of-a-kind show has something for any aged. Along with music from Broadway hits like “The Phantom of the Opera” to Mozart to Pop and Contemporary Rock, Garin’s charismatic stage presence, charm, and enchanting storytelling enables an audience to fully experience the magic of music with all of their senses. It’s no wonder that night after night, he receives standing ovations for his electrifyingly passionate performances. No matter what show you see, Garin delivers a moving lifetime experience that captivates audiences’ imaginations where they become fully engaged participants with their imaginations and senses and inspired to be the creators and painters of their own dreams.